Hang, two arms small edge w/weight to failure (3 to 8 sec tops—if you make 8 add weight next set), campus board ladders (1,3 5, 7, 9 – ideally harder moves done here but it’s about all I can handle at the moment–sad), lock-off kips (see Patxi’s vid) 8. Wall Clock. This may sound silly but do you think I could try these hangs on my pull up bar?Thanks T.
I wouldn't. 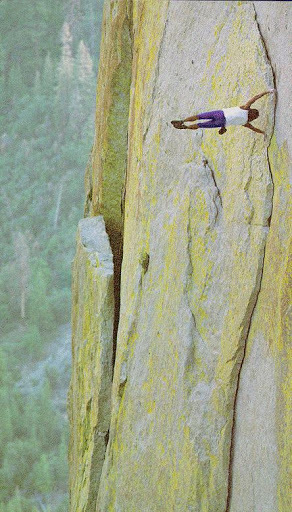 In fact, unless you are a climber I would not do this workout at all. I'd opt for something more like the last post for upper body work. You could mix incertain aspects of this workout but the movements involved–hangs and campus moves–are climbing specific and ultra stressful on the tendons. What kind of results have you seen in your climbing after performing these exercises? We'll find out pretty soon. Here's to all my frieeeeeends. What kind of results did you see? I am interested in integrating this into an upcoming periodized training schedule. What results did you see? I am interested in integrating PAP into an upcoming periodized training schedule. I haven't experimented with this enough. Hopefully I will this winter. I got good results but due to a tender elbow I couldn't push it as far as I'd have liked. A couple of friends of mine have incorporated it into their training. and, while we didn't get any quantitative data they did have their best climbing season this year. Thanks for the extrapolation Steve. We started our campus phase last night and will do it every-other day for 3-4 weeks. Each workout consists of a single static weighted max hang before each exercise. Four exercises done four times. 1.) 1-3-5-7-9 ladder2.) 1-3-2-4-3-5-4-6-5-7 double-dyno3.) 1-6-7-9 ladder4.) 3,R4,R5,R6,R5,R4,R3,L4,L5,L6,L5,L4,L3 TappingWe are designing the program on the idea that it needs to be harder than last time, and adding the max hang definitely does that. I will let you know how it goes.